We offer a number of different partitions here to help keep office spaces and other locations neat and organised. One of the different kind of partitions we offer is known as a Jumbo Stud Partition. Using a partition such as a stud is usually a better option than building an entire wall. Typically partitions act as a wall or helps create an enclosure. Though partitions aren’t very good at bearing loads so make sure the actual walls of the room and building are secure. Jumbo stud partitioning is a kind that’s very strong and durable and more secure than your average partition. It’s when a metal stud is used as the framework to create plasterboard wall. Jumbo stud walls are constructed from a 146mm metal stud partition system with a 148mm head and base track. Jumbo stud partitions are often used in factories as firewalls. They can reach up to ten metres high and have a fire rating of up to two hours. This means that they’re very fire resistant and, if placed strategically in a warehouse or factory, can help contain a fire should an accident occur. They’re cost effective and make for great fire protection in a high risk environment where you need a firebreak. 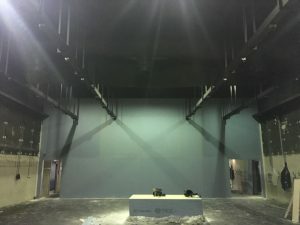 One advantage of jumbo stud partitions is that if things change, and you need to move or get rid of the wall entirely, you can just dismantle it and move it. It can be remade or just thrown out entirely. This is one of the ways it’s cheaper to use a partition than build a wall that you might not need in the future. You don’t need to worry about the size of the partition causing instability either. The studs are thicker than they usually are which allows for the higher wall. Stability and rigidness is also added using two layers of plasterboard rather than just one. Great care is taken to provide you with the best quality partitions possible. We here at KP Ceilings Company take your needs in to account and also the environment the partitions will be placed. It’s only by doing this that we can completely provide you with what you need. The partition will be made according to specifications set out by you and our own planners. Our skilled team know how and where to place things. We’re highly accredited with IPAF and PASMA accreditations. When you have us take care of the work for you, you can be sure that the job will be done well. We use some of the best professionals around. KP ceilings also offer other services that you might be interested in. 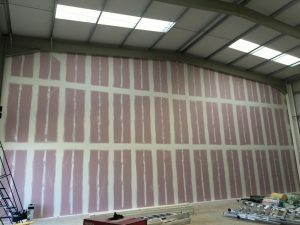 When ordering a partition, why not enquire about lighting and plastering in general. We cover the great Manchester area, as well as some of the surrounding areas. Get in touch with us today and see what we can do for you. We really are the best choice when it comes to jumbo stud partitions Manchester, suspended ceilings Manchester, and so much more.